Calvary Chapel Portsmouth has been meeting in South East Hampshire since the early 1990s, when our founding Pastor, Ron Matsen, came from the USA to Britain to work with a local defence contractor. Although working for a secular employer Ron’s real calling was to be a Pastor/Teacher and he soon started a small Bible study group in his home. With the encouragement of local Evangelical Pastors, Ron extended this work to a larger group meeting at a local school. The first Calvary Chapel began in Southern California in 1965 with a congregation of 25 people. In the late 1960s and early 1970s the church became home to groups of hippies and surfers in what was popularly known as the ‘Jesus Movement’ and gradually more Calvary Chapels were planted throughout America and internationally. The church is devoted to a faithful verse-by-verse, chapter-by-chapter teaching of the Bible and at Portsmouth we have been taught through the entire Book several times. Through Ron’s many years of experience with Calvary in America, during the 1990s he was able to call on the help of many old friends to come over and help with the work of establishing the church. In the early days this gave the church an American feel, but as the membership grew and the Matsen family became absorbed into local life things became more anglicised. Over the years we have met in different premises in the Horndean/Waterlooville/Portsmouth area: in homes, schools, converted offices and a warehouse, and even in the local Hilton Hotel. During this time the church has held Bible teaching and FACT (Fellowship of Active Christian Thinkers) conferences which have been opportunities to encourage the wider Church of God. Ron Matsen ended his time as our Pastor in September 2011 and the following year he an his family emigrated to New Zealand to take up new work for the Lord there alongside internationally acclaimed Bible teacher, Dr Chuck Missler. 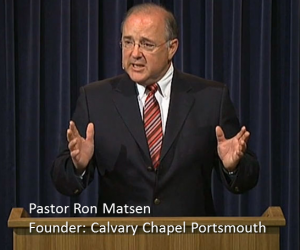 Calvary Portsmouth is eternally indebted to Ron for his faithful leadership, during which time many have grown in the knowledge of Jesus Christ as their Saviour and gone on to serve Him around the world. Following a long association with Calvary Portsmouth Barry Forder was appointed as our Pastor in January 2012.